Cheating Gourmet, makers of premium frozen seafood products, announced a rebrand to Scott & Jon’s, Auburn, Maine. Now named after co-founders and brothers, Scott and Jon Demers, the rebrand is accompanied by a fresh look and new line of pasta and noodle bowls, featuring sustainably-sourced shrimp and under 300 calories. 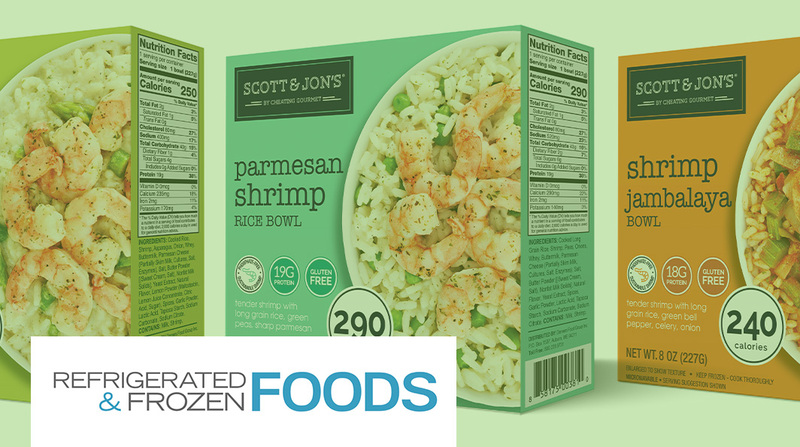 Now available in the frozen seafood section of retailers nationwide, the rebrand is intended to reinforce Scott and Jon’s commitment to quality and transparency. Scott & Jon’s Shrimp Rice Bowls come in Garlic Butter, Creamy Parmesan, Coconut, Jambalaya, Shrimp Risotto, Sweet Chipotle and Cilantro Lime, while the Shrimp Noodle Bowls are available in Ramen and Spicy Ramen and Shrimp Pasta Bowls come in Shrimp Alfredo and Shrimp Scampi.